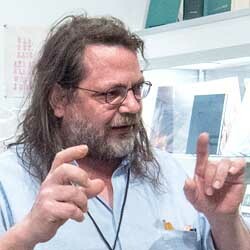 Max Schumann has been working at Printed Matter, Inc. for 25 years: as Bookstore Manager since 1993, then as Associate Director since 2005, and currently as Acting Executive Director. Max has played a key role in the development of many of Printed Matter’s programs and services over the past three decades. Among many other projects that he has contributed to at Printed Matter, Schumann curated the exhibitions “By Any Means Necessary: Photocopier Books and the Politics of Accessible Printing Technologies” (1992); “PROTECT ME FROM WHAT I WANT: the Multiples and Editioned Works of Jenny Holzer (2002); and “A Show About Colab (and Related Activities)” (2011). Max also curates “Friendly Fire”, which features independent artists and activist publishing collectives and individuals, in the New York Art Book Fair, which Printed Matter founded and has organized since 2006. Max is also a working artist whose work has been exhibited internationally, and is a member of the loose-knit Cheap Art movement. Max serves on the Board of Directors of Primary Information, a non-profit artists’ publishing imprint, and on the Board of the Bread and Puppet Theater, one of America’s longest running non-profit experimental theater groups.